The U.S. closed out 2016 with a solid jobs report that included record-high wage growth. The country added 156,000 jobs in December, down from 204,000 in November, according to data released today by the U.S. Bureau of Labor Statistics. 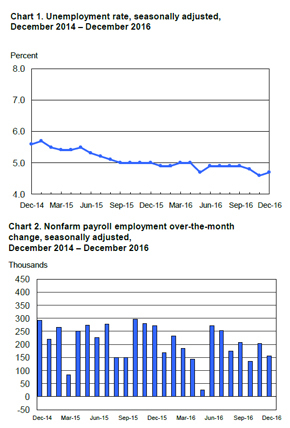 The BLS revised the November gains from the previously reported figure of 178,000. Bloomberg economists had estimated job gains of 175,000 for December. Total employment in December was 7.5 million, bringing the unemployment rate up 0.1 point to 4.7 percent. In 2016, 2.2 million jobs were added, marking the sixth-consecutive year that gains were above 2 million. Some 2.7 million positions were gained in 2015. This is the longest period of consecutive gains exceeding 2 million since 1999, according to Bloomberg. While the number of long-term unemployed and the labor force participation rate were relatively unchanged, the number of discouraged workers, or those not searching for work because they believe no jobs are available to them, decreased by 237,000 in December compared to the prior year. The Federal Reserve stated that the December jobs figures brought the U.S. near maximum employment, Bloomberg reported. Healthcare added the most jobs of any industry in December, gaining 43,000 positions with 30,000 of those in ambulatory healthcare services. Food services and drinking places added 30,000 jobs, while social assistance added 20,000 positions and financial activities added 13,000 workers. Manufacturing added 17,000 positions, while employment in other industries such as professional and business services, construction, wholesale trade, retail trade, was little changed. Wages grew in December at the fastest rate since 2009, Bloomberg reported. Average hourly earnings for private nonfarm payroll employees rose by 10 cents to reach $26.00 after decreasing by 2 cents in the month prior. Average hourly earnings have increased by 2.9 percent over the year.